Why Should You Use Aluminum Louvers? Are aluminum louvers right for you? Find out now. As louvers are becoming more and more utilized by commercial properties, many people are finding out how aluminum louvers in particular can benefit you. Sure, you could stick to traditional fencing, but aluminum louvers actually offer a lot more benefits than you may realize. Protecting your property is a necessity but it’s also important to look into what options may suit you best. If you find yourself wondering whether you should get a traditional fence or invest in aluminum louvers, consider these benefits first. If you need something custom to your needs, louvers may be your answer. Because aluminum is a flexible material, this means you can customize it to your specific desirability. This makes it ideal for generators, air conditioning units, or anything else that needs to be custom designed to promote airflow. 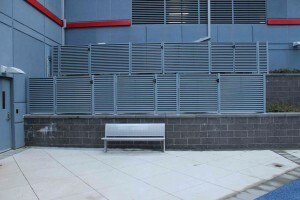 Plus, custom louvers can be built to suit any kind of terrain, including grass or concrete. Aluminum is a fantastic building material because it needs almost no maintenance whatsoever. It doesn’t fade or rust like other kinds of metal so that’s not even something you need to look out for. Additionally, aluminum is pretty durable and will last a long time, regardless of whatever environmental factors like rain or snow your aluminum louvers may face. This is the reason many of us invest in fences at all. Adding a sense of security to a commercial property is easy with louvers, as they are often considered safer than fences because of their private nature. Louvers are more difficult to see through while also being much more heavy and resistant to being broken into. Louvers are also difficult to scale over. Aluminum is an easy material to recycle. As a result, it’s easy to make louvers out of them that aren’t doing harm to the environment. This prevents valuable materials from being sent to the dump and wasting space while still giving you the benefit of a secure fencing option. This entry was posted on Friday, June 15th, 2018	at 1:14 pm	. You can follow any responses to this entry through the RSS 2.0 feed. Both comments and pings are currently closed.